A recent New York Times article urging readers to follow the CDC’s flu shot recommendation provides a useful case study of how the mainstream media manufacture consent for public vaccine policy by systematically deceiving the public about what the science says. The US Centers for Disease Control and Prevention (CDC) recommends that everyone aged six months and up, including pregnant women, get an annual flu shot to protect against the influenza virus. The mainstream media characterize this recommendation as being firmly grounded in science. The demonstrable truth of the matter, however, is that what the government and media say science says and what science actually tells us are two completely different things. By deceiving the public about what the science says, the media serve to manufacture consent for public vaccine policy. A useful illustration of how the media serve this function is a New York Times article published in January and written by Aaron E. Carroll, a professor of pediatrics at Indiana University School of Medicine and regular Timesblogger. The article is titled “Why It’s Still Worth Getting a Flu Shot”, and Carroll’s purpose in writing was to persuade his readers that, even though this season’s influenza vaccine was “particularly ineffective”, everyone should still get it. The argument Carroll presents is that, even in flu seasons like this past one when the vaccine is not well-matched to the predominant circulating strain of the influenza virus, since the vaccine is so extraordinarily safe, it still confers a great benefit to society. According to Carroll, a 2010 Cochrane review of influenza vaccination in healthy adults found that 37 people need to be vaccinated in order for one person to see the benefit, which represents “a big payoff in public health.” Mistakenly describing it as having been published in 2016, Carroll also cites a subsequent 2012 Cochrane review of vaccine effectiveness in healthy children that found “an astonishing payoff in medical terms”: just six children aged six or younger had to be vaccinated in order to prevent one case of influenza. Carroll further claims that the science shows us that harms from the flu vaccine are “almost nonexistent”. Carroll could have made his case stronger by citing the actual number from the 2010 Cochrane review, which is 33, not 37. This was an error Carroll evidently carried over from a secondary source, which is perhaps an indication that he never read the actual Cochrane review, which might also help explain how he could so grossly mischaracterize that review’s actual findings, as you’re about to see. For starters, it is curious why Carroll would cite the estimated effectiveness of the vaccine “under ideal conditions”—which is to say when the vaccine completely matches the circulating virus—in order to support his argument that it’s worth getting even in poorly matched years. Why didn’t he instead cite the study’s more relevant estimate of vaccine effectiveness under “average conditions”, when the vaccine only partially matches the circulating strains? The most obvious answer is that relaying the review’s finding that “100 people need to be vaccinated to avoid one set of influenza symptoms” would be counterproductive to his purpose. But that’s just the start of Carroll’s deception. Whereas he characterizes the 2010 review as though the science fully vindicates public policy, in fact the Cochrane researchers were highly critical of the CDC’s recommendation and challenged the fundamental assumptions underlying it. They observed that the primary rationales the CDC has offered are that mass vaccination will (1) reduce transmission of the virus and (2) reduce the risk of potentially deadly complications from influenza. 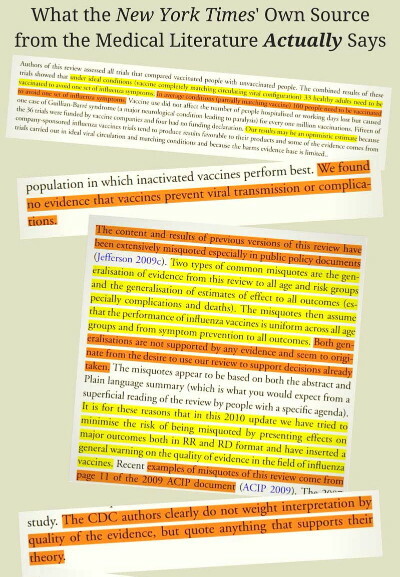 And yet their review turned up “no evidence that vaccines prevent viral transmission or complications” (emphasis added). In fact, none of the studies they looked at even presented any results “evaluating the ability of this vaccination to interrupt the spread of the disease”. Likewise, none bothered to report “any evidence of effect on complications.” In other words, none of the studies the Cochrane researchers looked at in their comprehensive review of the literature even seemed to consider the question of whether the central assumptions underlying the CDC’s recommendation were actually true. This is a remarkable illustration of the institutional myopia that exists when it comes to the politically sensitive issue of vaccines. Once recent study, however, did bother to look at the question of whether the vaccine prevents transmission. Published on January 18, 2018, in the journal of the Proceedings of the National Academy of Sciences of the United States of America, PNAS, the study’s authors screened volunteers with confirmed cases of influenza and took breath samples. And among their findings was “an association between repeated vaccination and increasedviral aerosol generation” (emphasis added). The Cochrane researchers found not only that ‘reliable evidence on influenza vaccines is thin’, but also that ‘there is evidence of widespread manipulation of conclusions and spurious notoriety of the studies. Another thing Aaron Carroll failed to disclose to Times readers is the rather important caveat that the Cochrane researchers attached to their findings about the vaccine’s effectiveness. And it’s not as though this caveat was easy for him to miss; it’s presented as an explicit “WARNING” right at the top of the review just below the abstract. In other words, even the estimate of 100 people needing to be vaccinated for one person to receive a benefit may be overly optimistic. Whereas the Times would have us believe that the Cochrane review found that the flu vaccine confers “a big payoff in public health”, in fact, the conclusion the review authors actually arrived at was that their findings “seem to discourage the utilization of vaccination against influenza in healthy adults as a routine public health measure” (emphasis added). And whereas the Times would have us believe that the science has been settled that harms from the vaccine are “almost nonexistent”, in fact, the 2010 meta-analysis expressed concern about the lack of safety data. “The harms dataset from randomized studies is small”, they observed, and the studies’ authors “appear to regard harms as less important than effectiveness assessment.” Even among the studies that weren’t funded by the industry, “the quality of the majority of influenza vaccines studies is low”. Turning to the second Cochrane study Carroll cites, the 2012 review did find that evidence from randomized controlled trials “shows that six children under the age of six need to be vaccinated with live attenuated vaccine to prevent one case of influenza”. However, they once again cautioned that this finding needs to be interpreted in light of the “evidence of widespread manipulation of conclusions and spurious notoriety of the studies” tending to show favorable results. While Carroll describes the finding of the vaccine’s effectiveness in children under six as “an astonishing payoff in medical terms”, he does not relay the review’s finding with respect to children aged two or younger, which was that the perceived benefit of the vaccine was “not significantly more efficacious than placebo.” In other words, there was no good evidence that the vaccine is effective at preventing influenza in children younger than three. One would think that information, too, would be worth relaying to the public; but, then, that disclosure would not align with his whole purpose for writing, so it is understandable why Carroll would choose not to mention it. Perhaps the reason Carroll did not cite this number is that it wouldn’t have actually helped his case at all, since that result was “not significantly more efficacious than placebo.” In other words, there was no good evidence that the vaccine is effective at preventing influenza in children older than six. One would think that information, too, would be worth relaying to the public; but, then, that disclosure would not align with his whole purpose for writing, so it is understandable why Carroll would choose not to mention it. While the Cochrane researchers had intended to examine the question of safety as well as effectiveness, the absence of good quality data meant that they could not even carry out safety comparisons. Furthermore, specific influenza vaccines were known to be “associated with serious harms such as narcolepsy and febrile convulsions. Yet another fact the Times chose not to disclose to readers is that, far from science having established that harms from the vaccine are “almost nonexistent”, the 2012 review found that there was “no usable data” on the safety of the vaccine for children under two. In other words, according to Carroll’s own source, the flu vaccine has not been properly studied for safety in children aged six months to two years, despite the CDC recommending routine vaccination of children in this age group. In addition to recommending the vaccine for infants as young as six, the CDC also advises pregnant women to get the flu shot, even during their first trimester. The aforementioned 2014 Cochrane review looked at the science specifically with this recommendation in mind. And what they found in their systematic review of the literature was that the number of randomized controlled trials assessing the effects of vaccinating pregnant women was zero. The CDC’s recommendation that pregnant women get the flu shot is all the more disturbing given the fact that multi-dose vials of the flu vaccine contain the preservative Thimerosal, which is half ethylmercury by weight. Ethylmercury is a known neurotoxinthat can cross the blood-brain barrier and accumulate in the brain. It can also cross the placental barrier and enter the brain of the developing fetus. While Thimerosal-free single-dose versions of the vaccine are available, the CDC does notspecify in its recommendation to pregnant women that they should opt for this version in order to avoid unnecessarily exposing their fetus to the toxic effects of mercury. The authors further commented that the use of mercury as a vaccine ingredient could explain the finding of a CDC-funded study published last September in the journal Vaccine that found an association between the influenza vaccine and spontaneous abortion. The CDC researchers looked at the 2010-2011 and 2011-2012 flu seasons and found that women who received a flu shot had twice the risk of having a miscarriage within 28 days of receipt than women who did not get the vaccine. Looking just at the 2010-2011 season, vaccinated women had a 3.7 times greater risk of having a spontaneous abortion. Moreover, since the 2009 Influenza A(H1N1) pandemic, seasonal influenza vaccines have included a varying pandemic H1N1 (or pH1N1) antigen component; and most alarmingly, the CDC researchers found that vaccinated women who had also received a pH1N1-containing influenza vaccine in the prior season had a 7.7 times higher risk of spontaneous abortion. …the Cochrane researchers actually went so far in their criticism of the agency as to accuse the CDC of deliberately misrepresenting the science in order to support their policy. In sum, whereas the New York Times would have us believe the science is settled that the influenza vaccine confers “a big payoff in public health” and carries “almost nonexistent” risk, even its own sources from the medical literature found no scientific evidence to support the CDC’s recommendation and highlighted the alarming lack of good quality safety studies despite the known serious harms associated with the vaccine. In fact, whereas the New York Times characterizes the 2010 meta-analysis as though it vindicated public policy, the Cochrane researchers actually went so far in their criticism of the agency as to accuse the CDC of deliberately misrepresenting the science in order to support their policy. 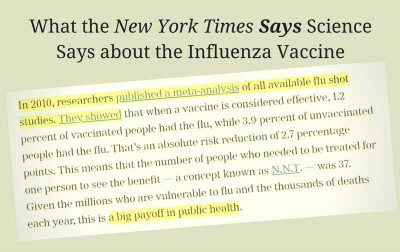 It is perhaps not too surprising, therefore, that the New York Times would so deceptively mischaracterize the science regarding the effectiveness and safety of the influenza vaccine, given the fact that, by doing so, it was simply following the CDC’s example. This article is a condensed adaptation of part one of a multi-part exposé on the influenza vaccine. Click here to read the full original essay. Click here to sign up for the author’s newsletter to stay updated with his work on vaccines and receive his free downloadable report, “5 Horrifying Facts about the FDA Vaccine Approval Process”.